Hi, everyone! Things have been so busy for me lately; I am getting behind in everything it seems. I haven't had much free time this week to visit many blogs, but I will try to catch up with you soon. The other thing I'm behind on is uploading cards to my own blog and on-line galleries! LOL! My first card is one I made for the Splitcoast sketch challenge this week. I thought this was a really cool sketch design, and it was conducive to my using this Penny Black image for my sympathy card. The sketch design Roxie used was inspired by a card my talented friend, Dawn (Flowergal36) made. I colored the flower image with my bravo burgundy and always artichoke markers and stamped onto very vanilla cardstock. The beautiful background designer paper is Cosmo Cricket. I pierced the outer edge of the dp, as well as one side of the image panel, and faux stitched with a bravo burgundy marker. Oh, and that ribbon......to-die-for May Arts silk ribbon I purchased from Sharon Johnson this past summer when I was up at a Michigan stamping event. The May Arts silk ribbon is THE BEST ribbon with which I've worked! It's not bulky--which, again, helps with mailing--and it is easy to manipulate when using it on the Bow Easy, as I did here. These next few cards are a series of sympathy cards I made for a customer. This first one was made using SU rub ons, the wide oval punch, and this pretty translucent yellow silk flower that came as a package my friend Joanne (JoJot) sent to me. I layered the SU flower punch on top of that, along with using the 1/4" black circle punch for the flower center. I hate wasting cardstock, so, as much as I can, I try to use cardstock I've saved after using my Nestabilities. The white layers are actually frames. That helps to cut down on the thickness of a card, too. When making cards for customers, I always try to keep layers and chunky embellishments to a minimum for their mailing purposes. 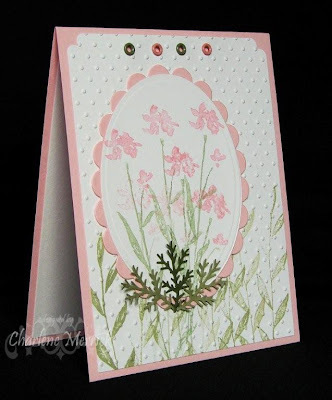 I was inspired to make this card after a beautiful card I saw in CardMaker magazine. I have to hunt down the issue and give the original artist credit for this beautiful card. 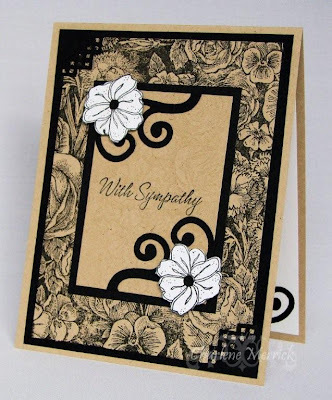 I used my SU floral bg stamp in black onto kraft cardstock, this In Full Bloom flower stamped in black onto white and cut out, the square steps punch for the corner, and the Sizzix flourish die. The sentiment is from Warmest Regards. I was inspired to make this card after seeing this technique used on Splitcoast by a few talented stampers. Most recently, it was Harriet's (hskelly) card using the Upsy Daisy set that really motivated me to try this technique. I stamped my Petal Prints flower in Going Gray, rocked the outer edge in Basic Gray and stamped them onto Sahara Sand cardstock. I then took my white Prismacolor pencil to color over the gray. I just love the soft effect it gives these flowers. 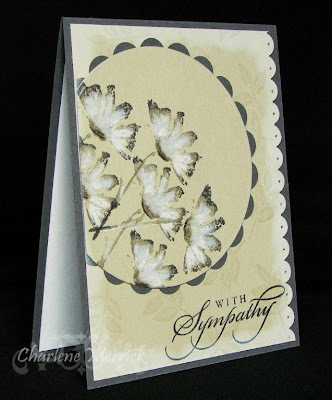 One of my favorite stand-by stamp sets for sympathy cards is The Art of Life. I love it's simple elegance. I colored my stamp with SU markers and then stamped onto white cardstock. I even pulled out my Crop-a-dile to use these pretty eyelets....something I don't use much anymore, but need to. I have to say of all the Cuttlebug embossing folders, the one I love the most is the dotted swiss folder. Thanks for looking! I always appreciate your visits and comments. I hope life is treating you well, my friend. If you've got a moment, tell me something good that's happened to you lately. omgoodness! these are all gorgeous! i mean gorgeous! wow! Well, these were definitely worth waiting for!!! What gorgeous cards!!! Hi Charlene! My you have been a busy-bee sweetie! Awesome take on that first sketch, it's so pretty...gorgeous papers, stamp and sentiment! Love that black in your other cards, and that yellow flower really makes it pop! 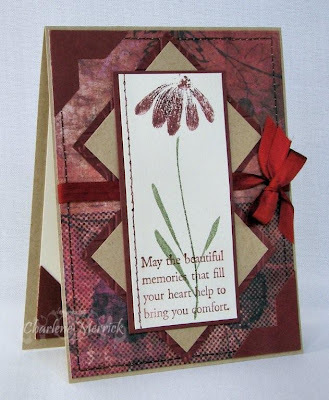 Your last creation is just lovely with that embossing and those images...the eyelets really finish it off nicely too! Wow! Charlene, these are all so beautiful! Fabulous! Charlene, these are just beautiful...I see such beauty and elegance in these...I do have a favorite and that is the one done with the prism white pencil, I will have to try that! And the floral background is gorgeous too...all are just beautiful. My favorite embossing folder is the swiss dots too. Hope you get a minute to rest and relax this weekend! OH! These are all just STUNNING Charlene! One is more gorgeous than the next!!! I hope you get some "you" time soon!! Mercy, girl...sooo much beauty going on here!!!!! Each and every card is totally gorgeous...sooo many beautiful colors, layers, colors, stamps....you are such an amazing artist!!!! These are all beautiful sympathy cards CHarlene. I bet she was very happy with these.